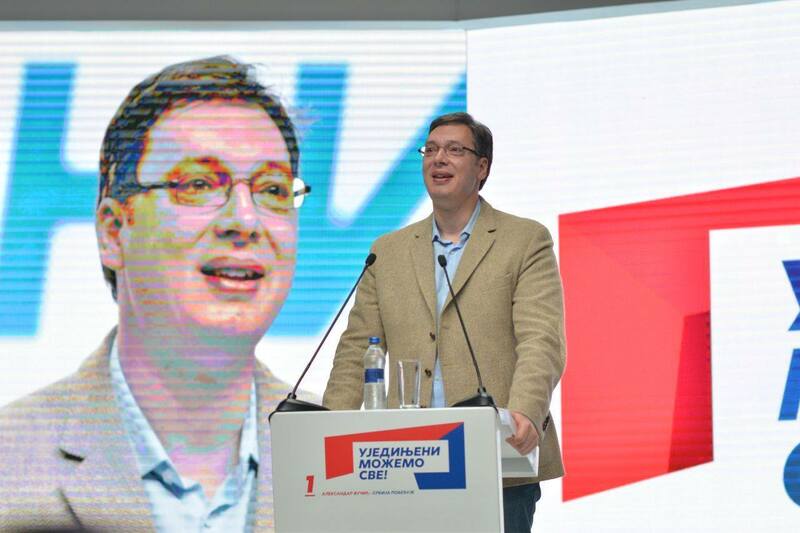 Then, at the height of his power, Vučić called fresh elections. 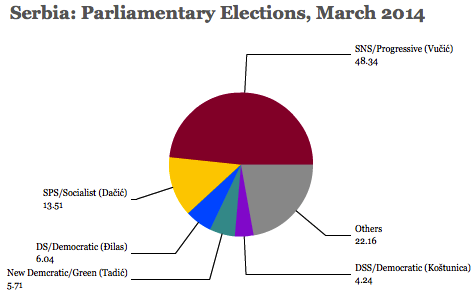 Polls today give the SNS around 50% of the vote for Sunday’s elections and, in an electoral system of proportional representation, it means that the SNS could return to power with an absolute majority — or even a supermajority — in the 250-member National Assembly. Dačić’s SPS rests precariously in second place, barely in double digits, and a sketpical Vučić could easily kick his graceless junior partners out of government with a large enough victory on Sunday. Dačić may still retain his position, because his party’s nationalist perspective is a useful pressure valve as the Serbian government inevitably normalizes relations, however gradually, with Kosovo. 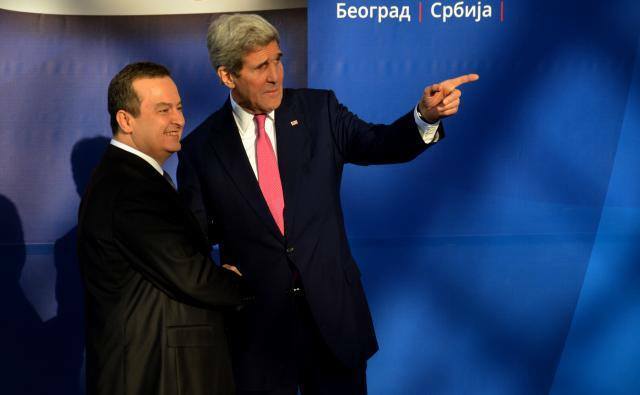 (A step that’s forcing Kosovar leaders to grant politically difficult protections to ethnic Serbs within Kosovo). Vučić’s challenge between now and 2020 will be to implement political reforms that professionalize the public sector and to enact economic reforms that privatize areas of the public sector — including telecommunications, copper mining and coal mining — that might be more productive if subject to market pressures. Above all, he’ll have to reduce the sense that corruption still runs rampant, in Serbia as throughout much of the Balkans. The third-placed party, according to the same polls, is the party where both Nikolić and Vučić began their careers, the far-right Serbian Radical Party (SRS, Српска радикална странка), founded in 1991 by Vojislav Šešelj, who was extradicted in 2003 to the International Criminal Tribunal for the Former Yugoslavia. Nikolić, his deputy, ultimately left the party over ideological differences and formed the SNS, today’s governing behemoth, and the SRS lost all of its seats in the National Assembly in the 2012 election. In 2016, however, the Radical Party is back, and they still hold the strongly anti-NATO, anti-Europe and pro-Russia ultranationalist views that Nikolić abandoned on his path to the presidency. 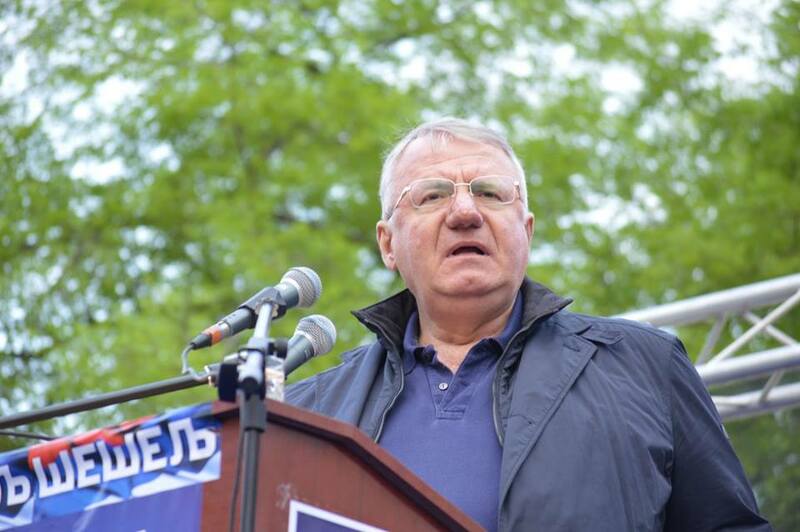 Buoyed by his acquittal of war crimes by the ICTY at the end of March, Šešelj (who found himself to the right of his former ally Milošević), is running hard among those Serbians who have grown disillusioned with the prospect of EU accession. But Šešelj still carries a cloud of suspicion for his role in the ethnic cleansing of Croats and Bosnians in Croatia and Bosnia and Herzegovina in the 1990s, notwithstanding the fact that prosecutors botched a case that ran for 13 years. A hero to Serbian nationalists from the pre-independence days when he was jailed by Yugoslavia’s communists in 1984 for advocating a nationalist Serbia, he could easily win a bloc of seats in the National Assembly to harass his one-time allies. Another nationalist party, the conservative Democratic Party of Serbia (DSS, Демократска странка Србије) hopes to return to the National Assembly after it fell below the 5% electoral threshold in the last election. It has allied with the Dveri Movement (Покрет Двери), another hard-right organization with ties to the Serbian Orthodox church. Barring a collapse in support, the SRS, DSS and Dveri ultranationalists will form the de facto opposition bloc in Serbia’s National Assembly. Meanwhile, the center-left seems not to have learned the lessons of 2012 and 2014 and, despite an early effort to unite, the Democratic Party and Tadić’s Social Democratic Party will compete separately. Polls show that each wins just around 5% of the vote, coming precariously close to being shut out of the National Assembly altogether.